“Como Bluffs, Wyoming – Front Exterior of Fossil Cabin and Sign with a Dinosaur on it” c.1940. Wyoming State Archives, Department of State Parks and Cultural Resources. Como Bluff, Wyoming, c.1961. Color photo of building at gas station. Wyoming Recreation Commission Collection, Wyoming State Archives, Department of State Parks and Cultural Resources. The house and garage for the proprietors of the Fossil Cabin. Pop. 150. Alt. 6,566 feet. Carbon County. Two hotels, accommodations for 100. Virginian. $1.00 up, Eu. ; O’Connor, $1.50, Amer. One garage; storage, 50c; washing, $1.50; Gas, 25c; Oil, 75c. Route marked through town and county; signs at approach of town. One R.R. crossing at grade, not protected. One bank, 1 R.R. 1 Exp. Co., 1 Tel. Co., 1 public school, 20 automobiles owned. Camp site[sic]; good trout fishing. Welcome to Medicine Bow is the way that travelers on today’s U.S.30 are greeted when entering from the Laramie side of the highway. Medicine Bow is the only town with gateway signs that are different on either side of the Lincoln Highway. The Virginian Hotel has been a staple of the Lincoln Highway since before the final route of the highway was finalized. The Union Pacific railroad depot dates to around 1868. The Trails End Cemetery in Medicine Bow has been in continuous use since at least 1889. No service today…none to be found for several years, in fact. 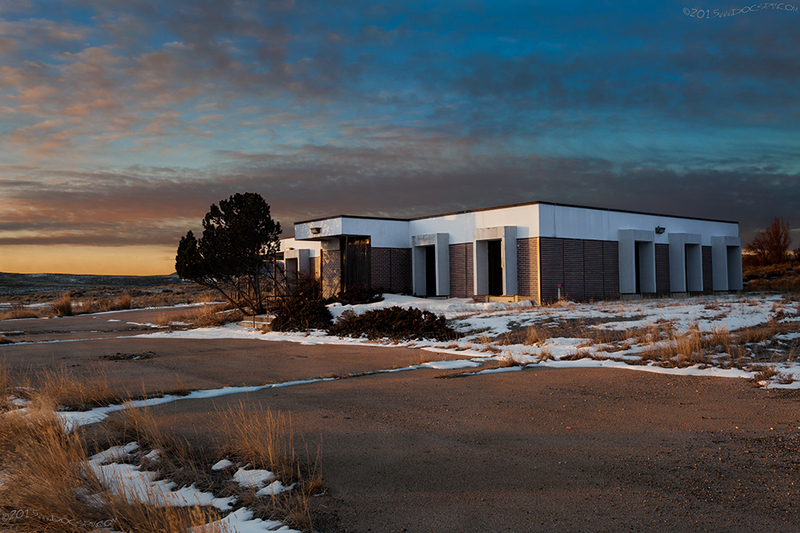 This service station was originally built in 1947; when Interstate 80 opened between Walcott Junction & Laramie in October of 1970, business rapidly declined. “Raised in 1981” is what the engraving reads next to the door. The day of image capture, it was abandoned and for sale. As of August 2018, new owners have re-opened the Little Dip Diner. 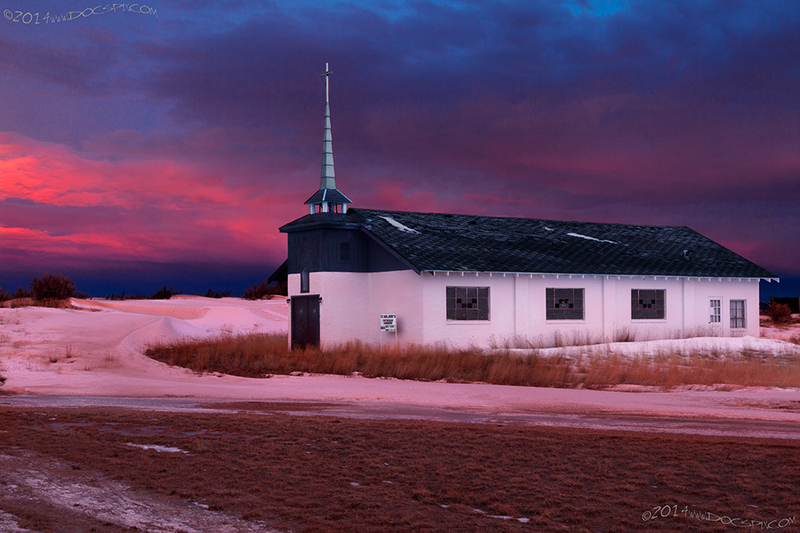 St. Malachy’s Catholic Church faces the start of another day in Medicine Bow. This sign greets drivers heading towards Laramie on the current U.S. 30; this sign tells a story that is familiar around the state; energy. First, coal was found in this area, and was exploited by the Union Pacific Railroad; followed by oil, and finally wind power. Medicine Bow was home to the world’s largest wind turbine constructed in 1982. It was ironically felled by a large wind gust on January 14th, 1994. The following images were made somewhere in Carbon County, on private property with the permission of the landowner. Please do not ask either the exact location or for the property owners name. This bridge is believed to have been placed here in about 1913. Unusual for its time; it’s almost 40′ wide and could accommodate two vehicles simultaneously. The original 1913 Lincoln Highway is still used as a ranchers two-track road in Carbon County, WY. The town of Carbon came into existence because of large deposits of coal that were found in the area. By 1899, the seventh mine that was opened two miles south of the town had finally given out. This and a fire that all but destroyed the town, it was abandoned in around 1902. All that remains are some foundations and the town’s cemetery. Circa 1875, Carbon, Wyoming. Downtown Carbon with Houses in the Background. Wyoming State Archives, Department of State Parks and Cultural Resources. Circa 1875, The Front of the Union Pacific Coal Company, People Standing in Front of the Building. Wyoming State Archives, Department of State Parks and Cultural Resources. The town of Hanna was founded in 1889 named for businessman Mark A. Hanna. Aside from being a coal and shipping magnate, this former U.S. Senator from Cleveland, Ohio convinced officials of the Union Pacific that they should invest in the development of its own coal fields. Hanna was a company town, through and through. As such, the town was essentially vice-free. Elmo was a Finnish village that was incorporated in 1917 about a mile east of Hanna; out of the reach of the company regulations. Bars and brothels flourished. There was a pair of tragedies that struck the town; the first was in 1903 when an explosion in the No. 1 mine took the lives of 159 miners. The second came in 1908 when 59 miners lost their lives in the same mine. This gateway sign is on the east side of the former borough of Elmo. This is, interestingly enough, on the third alignment of the Lincoln Highway. 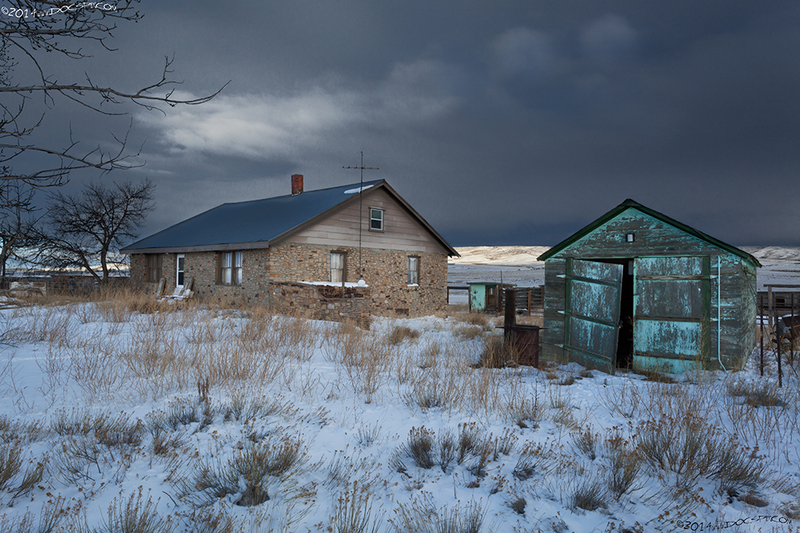 Two coal miners tenements sit vacated in the former village of Elmo. 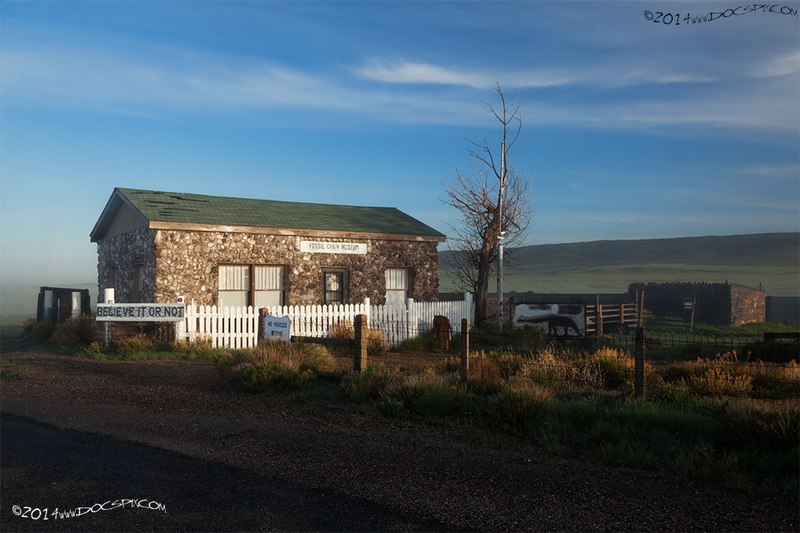 A bank building in Hanna waits for a new owner, (as of the date of image capture – 27Nov15). The Saratoga & Encampment Valley railroad ceased operations in late 1955. “Fort Fred Steele, Wyoming Territory, 1868 Three forts were built in southeastern Wyoming Territory by the Federal government in order to protect the UP railway workers. These three were Fort Russell (west of Cheyenne), Fort Sanders (south of Laramie) and Fort Steele (east of Rawlins). Fort Steele was established in late June, 1868. The soldiers were quartered in tents until more permanent log buildings could be built. In the center of this photograph, on top of the hills one can see the frameworks of some of the wooden buildings.” (Photograph by Arundel C. Hull, pioneer photographer). Photograph, Box Number 31, Folder: Ft. Steele, Clarice Whittenburg papers, Collection Number 400066, American Heritage Center, University of Wyoming. Pop. 200. Alt. 6,510 feet. Carbon County. One hotel: Ft. Steele Hotel, $1.50-$2.00. Gas, 25c; Oil, 75c. Route marked through town and county. One R.R. crossing at grade, not protected. One. R.R., 4 general business places, 1 Exp. Co., 1 Tel. Co., 1 public school, electric lights, 5 automobiles owned. Camp site. Good trout fishing. 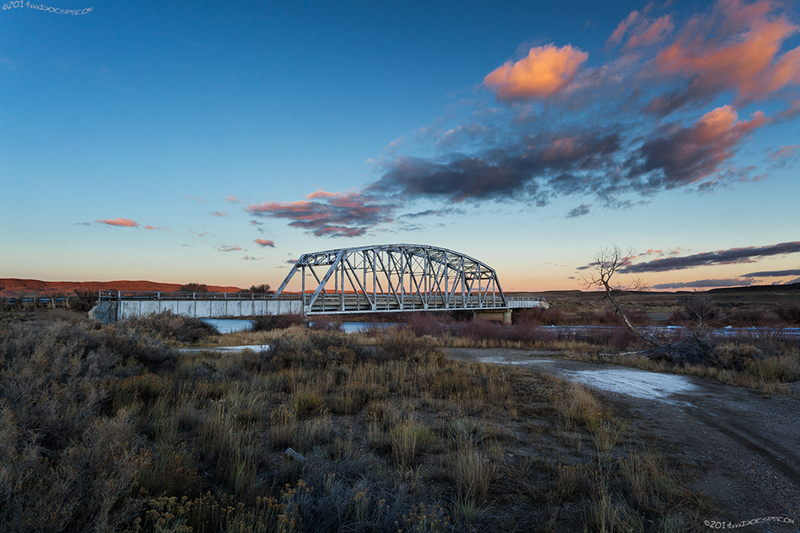 This truss bridge has been here since 1930 when it replaced another, older truss-type bridge that is still in use near Saratoga as a footbridge over the North Platte River, about fifteen miles south. Pick Bridge, as it’s known today was initially used for horse-drawn wagons beginning in about 1910. It was a natural fit for the fledgling Lincoln Highway in 1913. Today, Ft. Fred Steele is owned and operated by the State of Wyoming Parks Department. It’s open for self-guided tours from May 1st through November 15th. There is a rest area for travelers on Interstate 80 and a section of the L.H. with a truss bridge over the North Platte River that was placed here in 1930. “Benton, Wyoming Territory. No other town along the first Union Pacific Railway line the impact of the infamous “Hell on Wheels” more than Benton. No jail was built to hold its criminals but the little cemetery sheltered more than one man forced to wear his boots to grave. Benton became a ghost town when a mere infant three months old. The depot was moved westward[sic] to Fort Fred Steele and both the work camp and temporary tent houses disappeared.” (Photograph by Arundel C. Hull, pioneer photographer). Photograph, Box Number 31, Folder: Benton, Clarice Whittenburg papers, Collection Number 400066, American Heritage Center, University of Wyoming. Street Scene in Benton, Wyoming Territory, 1869. (Photograph by Arundel C. Hull, pioneer photographer). Photograph, Box Number 31, Folder: Benton, Clarice Whittenburg papers, Collection Number 400066, American Heritage Center, University of Wyoming. This was truly one of the original “hell on wheels” towns that dotted the landscape during the time of the construction of the transcontinental railroad. It was in existence for only three months from July to September of 1868. This town had a population of almost 3,000; and reportedly, over one hundred people died in gunfights here. Today, there is nothing that remains to indicate anything was here. The plat had no date, but the file it came from stated that it might have been as recent as 1945, from the information found on the plat itself, (two different roads: one labeled; “main auto road”, the other; “Lincoln Highway”, would suggest this is probably accurate. This gateway sign greets motorists as they enter town on the former Lincoln Highway from the west. This location would become known as Parco, for the Producers and Refiners Oil Company on April 11th, 1923. It would be renamed as of July 1st, 1943 as Sinclair, in honor of the founder of the Sinclair Oil Company, Harry Sinclair. The Sinclair Oil Company has a refinery here, “The West’s Most Modern Refinery”, is how it’s advertised. This town had a resort-hotel that was designed by Denver architects William and Arthur Fisher. The Corner Bar in Sinclair, WY was built in 1961; it’s still an operating neighborhood bar that sits on the west edge of town on Lincoln Avenue. 1: The Builder of the “World’s Oldest Cabin” http://www.uwyo.edu/robertshistory/worlds_oldest_cabin_fossil.htm website, accessed 7Mar2015. 2: Informational sheet, Box Number 442, Folder Number 10, James L. Ehernberger western railroad collection, 1862-2001, Collection Number 10674, American Heritage Center, University of Wyoming. 4: http://quod.lib.umich.edu/l/linchigh/x-lhc1048/lhc1048. University of Michigan Library Digital Collections. Accessed: October 25, 2015. 7: Informational sheet, Box Number 440, Folder Number 20, James L. Ehernberger western railroad collection, 1862-2001, Collection Number 10674, American Heritage Center, University of Wyoming. 8: Brundy, Clyde M. “Our Love Affair with Ft.Steele”, Denver Post Empire magazine, September 5th, 1971, pp. 10-12. 10: Informational sheet, Box Number 442, Folder Number 18, James L. Ehernberger western railroad collection, 1862-2001, Collection Number 10674, American Heritage Center, University of Wyoming. 11: http://quod.lib.umich.edu/l/linchigh/x-lhc1188/lhc1188. University of Michigan Library Digital Collections. Accessed: October 25, 2015.